Here is a memorable baby shower game and activity that is very special to the expectant mother. This is a great game for a Springtime, garden, butterfly, or flower baby shower theme. Preparation for this baby shower activity: Print off a copy of this Baby Shower Flower game card for each of your guests. 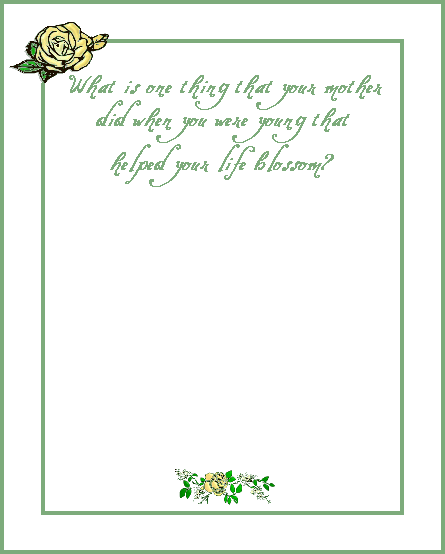 How to play: Give each guest a copy of this Mother's Baby Blossom card and a pen or pencil. Give them 5-10 minutes, and have them write down a memory they have of something that their mother did for them when they were young that helped their life blossom. Have everyone read theirs when everyone is finished and then collect the cards and give them to the expectant mother to always remember. Enjoy this baby shower game and activity!